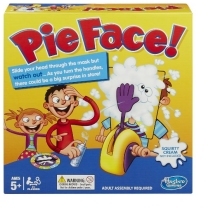 Pie Face is an original and exciting game where someone WILL get splatted! Players load the throwing arm with squirty or wet cream, place their face in the frame, start turning the handles and prey the they don't get a face full of cream! 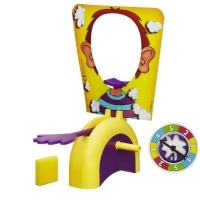 Evry turn of the handle, without getting pie-faced, will earn the player one point. The first to 25 points is the winner. We constantly check for Pie Face stock, so you don't have to. Receive email alerts when Pie Face online stock is found.